LOCATION This semi detached property sits on a generous plot towards the end of a small cul de sac, in a popular village location. Southwater village centre is only 3.5 miles from Horsham town centre with its wide range of restaurants, shops and recreational facilities. The village itself boasts a village centre named Lintot Square, where you will find a Co-operative shop, Boots Pharmacy and post office, amongst other independent traders. The property is located within a short walk of a large open green space, while the village further benefits from two schools and a 90 acre country park. 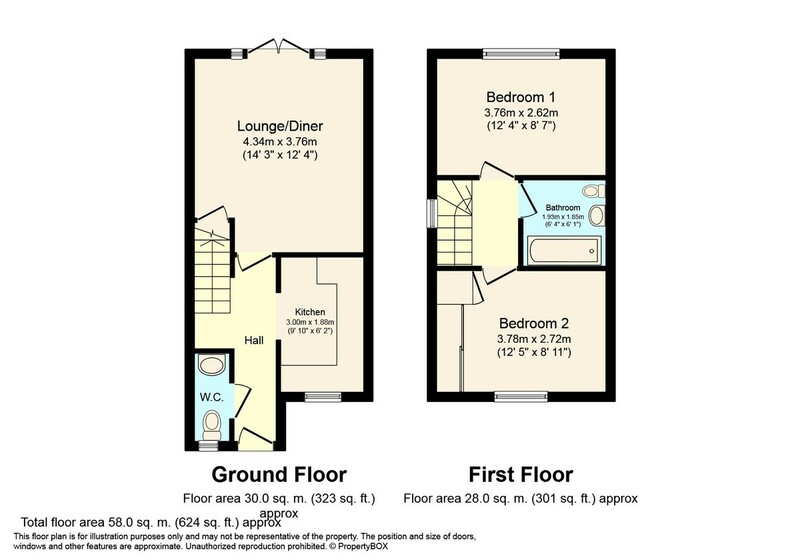 Due to the property’s convenient location, it provides easy access to the A24, A272 and A264. PROPERTY The front door opens into the Hall, which has stairs taking you to the first floor and doors opening to all Ground Floor rooms, including the WC. The Kitchen overlooks the front garden and has space for a range of appliances. Completing the Ground Floor accommodation is the 14’3 x 12’4 Lounge/Diner, which has space for sofas and a dining table, and boasts double doors that spill out to the large Rear Garden. To the First Floor you will find the Family Bathroom and two Double Bedrooms, with the largest boasting built in wardrobes. OUTSIDE This spacious two Double Bedroom semi detached house is set back from the road at the bottom of a small cul de sac and has a driveway, providing off street parking, that leads to the Single Garage, which measures 16’2 x 8’6 and has an up and over door. To the side of the property, gated side access leads through to the large Rear Garden, which has a paved patio, perfect for barbecues in the summer months, leading on to an expanse of lawn, which is ideal for children to play or for keen gardeners to make the most of.